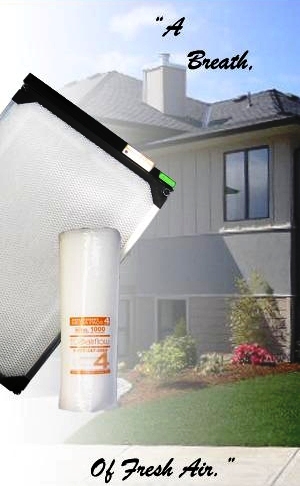 Formerly known as the AIRSCREEN 1000, the improved ECOairflow design features a short circuit proof power-head and U.S.A. made 16.5 gram weave bonded fiberglass filter media! THE AIRSCREEN 1000 ELECTRONIC AIR CLEANER WAS FEATURED IN POPULAR MECHANICS MAGAZINE, SEPTEMBER 2003! Easy to maintain, new pop-up corners make maintenance a "SNAP"! Large photo of pop-up corners. ETL Ceritified! NATURE'S CLEAN AIR ........... INDOORS! NEW FRAME DESIGN WITH POP-UP CORNERS! Installing an ECOairflow Model 1000 Electronic Filter in your central heating/cooling system will dramatically improve indoor air quality. This filter removes household dust, dander, fungus spores, and bacteria that can damage your health. It is a non-ozone producing electronic air cleaner that operates on the principal of bi-polarization. This safe and simple process creates a polarized charge on the high efficiency media pads located inside the Model 1000 electronic filter. This polarized charge on the Model 1000 media pads causes airborne particles to stick, or adhere to the pads. STANDARD SIZES 12" x 24" 16" x 20" 20" x 24"
14" x 24" 16" x 24" 20" x 25"
14" x 25" 16" x 25" 20" x 30"
14" x 30" 18" x 20" 24" x 24"
15" x 20" 20" x 20" 24" x 30"
The EcoAirflow Model 1000 Electronic Filter (formerly the Airscreen 1000) is easy to maintain, just replace the inexpensive filter pads periodically as you would any furnace filter. Filter pad ordering information is included with each unit. This unit should be installed by a competent HVAC technician or a very skilled homeowner. Add an ECOairflow Model 6000 Filter Enhancer Probe a device that is designed to increase the filtering efficiency of any furnace filter, to include the excellent ECOairflow Model 1010 & 1500 series electronic furnace filters. Enhance your HVAC systems air quality with an ECOairflow Model 1000 Electronic Filter and enjoy cleaner, healthier indoor air. Voltage range: 8V min. to 30 V max. Now you can "screen out" indoor air contaminants with the ECOairflow Model 1000 electronic air filter. It is important today to have a top performing air cleaner in your home, as most homes in North America are 5 to 10 times more polluted than outside air. According to the lung association, when dirt lands on your skin you can wash it off. However; when it settles in your lungs, it can penetrate deeply in these tissues and cause a wide variety of respiratory problems. Modern homes have a wide range of household products stressful to our lungs like cleaners, paints, glues, aerosols, tiles, particle boards, synthetics, as well as harmful chemicals. Continued exposure to this unfiltered air increases asthma, allergies and breathing problems. The exciting Airscreen technology uses safe and simple electronic processes to remove contaminants as small as .01 microns. Protect you and your family today. Install this life-enhancing air cleaner in your home. WHY DOES THE MODEL 1000 WORK SO WELL? The ECOairflow Model 1000 Electronic Filter is a non-ozone producing electronic air cleaner that operates on the principle of bi-polarization. This safe and simple process creates a polarized charge on the efficient U.S.A. made media pads located inside the Model 1000 electronic filter. This polarized charge on the Airscreen media pads causes airborne particles to "stick" or adhere to the pads, thus creating an excellent air cleaning system - A HIGHLY EFFECTIVE PROCESS! This filter effectively traps airborne particles as small as .007 microns in size. Passive (non-powered) filters are not as effective below .03 microns. This filter allows easy airflow and can save you as much as 15% a year in heating costs over conventional throwaway filters saving you money. This filter holds a great deal of the material it catches, so you don't have to change the replaceable pads as often. Again, IT SAVES YOU MONEY! Please call or E-mail for prices in quantity and on oversize and non-standard sizes! Select here to order this highly effective air cleaning product for your family or business. This page, and all contents, are Copyright © 2019 by EnviroKnowHow, Cleveland, Ohio USA.